Nautel was recently closely involved in the formation of two of the largest medium wave transmitting facilities in their respective regions. The first is a 400 kW broadcast site in Bonaire, an island municipality of the Netherlands operating a Nautel NX400 transmitter. The second is a 2 MW site in Solt, Hungary, a small community about an hour South of Budapest, operating five NX400 transmitters through a sophisticated combiner. So, why operate such large broadcast facilities? And how do they minimize future operating costs? The Bonaire site is owned by Trans World Radio and broadcasts a Christian program, which has a strong listenership in the Caribbean Islands, Central America and northern countries in South America. TWR originally went on the air in 1963 at a 500 kW level but operating costs forced the broadcaster to cutback to 100 kW in 1998. The station had long desired to go back to the higher power level. Recent advances in transmitter technology, most notably high efficiency solid state designs, led TWR to upgrade its transmitter to the Nautel NX400. Updates were also made to the antenna system, with a new array enabling multi-pattern directional coverage that allows the station to target specific audiences at different times of the day. Antena Hungaria operates the Solt site and broadcasts local content in Hungarian throughout the country from a single transmission site. The transmission is also strong enough to cover parts of Slovakia, Austria, Slovenia, Croatia, Bosnia and Herzegovina, Serbia, Romania and the Ukraine. Maximum on-air at minimum cost is achieved through a properly engineered solution for the whole facility. 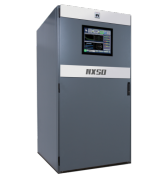 The NX400 transmitter selected as the basic building block for each site has an efficiency of greater than 90 percent from AC input to RF output. This significantly reduces operating costs relative to the previous transmitters, which used vacuum tube technology. 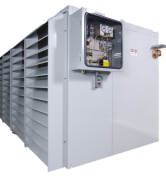 The new transmitters are configured to operate from the local medium voltage 11 kV, eliminating the need for an intermediate step-down transformer to 400 VAC that would have 1 percent to 2 percent losses. Both Bonaire and Solt transmissions employ a form of Modulation Dependent Carrier Level (MDCL), which dynamically adjusts the transmitter carrier level according to the modulation requirements for the transmitter. As indicated in the graph below, the carrier level is reduced as the modulation increases. This yields an efficiency improvement in the order of 30 percent but varies depending of the density of the program source. Research continues in an effort to further optimize MDCL to increase efficiency of medium wave transmissions. Earlier this year, Orban completed a theoretical study on the effect of program processing/compression that indicates a fairly dramatic improvement in operating efficiency in transmissions using MDCL. The BBC — original developers of Amplitude Modulation Companding (AMC) — has also completed a research project indicating further significant savings could be achieved using new values for attack times and compression levels. The BBC White Paper titled “WHP 333 AM Companding: Reducing the Power Consumption of LF and MF Transmitters,” is available for those who wish to gather further insight in the techniques used. In the case of the Bonaire installation, the efficiency and built-in 10 percent overhead in the NX400 enabled the station to come close to its original licensed power without the need for additional transmitter units and combiners. In Solt, the five NX400 transmitters are incorporated with a large, versatile combiner. 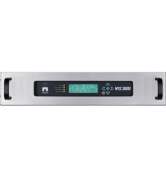 The NXC2000 combiner can be easily reconfigured if one or more transmitters are shut down, which ensures that maximum power is delivered to the antenna in all cases. The antenna system in Solt is a legacy system installed in 1977 that employs a 304-metrer mast ( .55 l) — optimum for ground wave propagation. Impedance matching from the open line feeder. There is a global vision for digitization in broadcasting as we move forward. Antenna Hungaria has proactively ensured that the transmission equipment purchased for Solt is compatible with the Digital Radio Mondiale digital radio standard. Due to the current lack of DRM receivers in the listening area, the broadcaster is only broadcasting on analog for the moment. The Solt 2-MW project including installation and commissioning went live Nov. 27, 2017.